Black Bamboo Chinese Restaurant is a restaurant with community roots — the owner, Sonny Chen grew up in West Hartford and takes great care in offering the area's best Chinese food. The made-to-order kitchen strives to accommodate all dietary and health needs, including gluten-free, vegetarian and vegan options. Everything from the kitchen is made with the freshest ingredients and of the highest quality. Open 7 days a week for lunch and dinner with the convenience of dine-in, take-out, delivery and catering. Feng Asian Bistro welcomes you to a polished, sophisticated urban interior that features stone and delicate wood screens, gleaming wood floors and inviting lacquer-red booths. Located in downtown Hartford and Canton, Feng features a broad range of elegant Pacific Rim cuisine from Thailand, China and Japan. Its atmosphere includes hip music, a great selection of martinis, happy hour specials and special events. Open for lunch Monday thru Friday and dinner seven days a week. Since 1999, Ginza has been receiving rave reviews from customers and the press. Hartford Advocate has named it Best Restaurant, Best Japanese Cuisine, Best Sushi and Best Service. Now there's hibachi theater with 70 seats! Authentic Japanese cuisine, including tempura and teriyaki, is served in a comfortable family atmosphere. Enjoy sake, fine American or Japanese wines and beers by the glass or bottle. And now you can have Ginza's great food delivered — place your order online. The ultimate Italian pizza! Featuring fresh mozzarella — the white mozzarella used in Italian family cooking — made especially for Luna, Italian plum tomatoes, imported Romano cheese, and 100 percent olive oil. The classic, traditional, Italian, thin crust pizza. Grinders, salad, wings, soda, dessert, wine and beer. 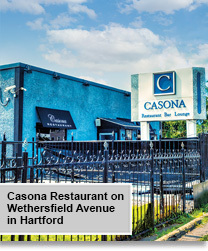 Connecticut Magazine "Top Ten Pizza," Hartford Advocate Four Stars, Hartford Courant Three Stars, Zagat Survey "Award of Distinction." Now serving Gluten Free Pizza and Hard Cider. Gift cards available. We deliver; call 860-233-0326. Pho 135 provides patrons with the best Pho, or Vietnamese noodle soup, but their excellent cuisine goes far beyond their name. Other specialties, made in an authentic Vietnamese style from special family recipes, include Shrimp Egg Rolls, House Special Vietnamese Crepe, Salmon Clay Pot, Filet Mignon Shaking Beef, and Sweet and Sour Fish Soup. In addition to the highest quality Vietnamese cuisine available, Pho 135 prides itself on its excellent customer service and friendly, welcoming atmosphere. Come and enjoy the best of cuisine and service at Pho 135 today. Harry's Bishops Corner offers award winning thin-crust pizza with an extensive list of fresh toppings. It extends a warm and inviting atmosphere with excellent service. The menu offers a variety of salads, gluten free crust, panini, lunchtime slices and creative specialty pies. Both lunch and dinner are served Tuesday through Sunday. Harry's BC offers quality wines at an exceptional value to complement any pie, as well as rotating taps with your favorite local craft beer. Catering is available for any event. Well known restaurateur Jimmy Chen has refitted this former barn with a crisp, contemporary interior design style that has quickly made it the Valley's place to go for an for an upscale dining experience. Steaks are a highlight on a menu that includes superb seafood, salads and appetizers, a raw bar and a variety of small plates. The comfortable bar serves selections from the extensive wine list, excellent cocktails and the best craft beers. A place to go for a fabulous dining experience. We bring inspired pan-Asian cuisine to the heart of Granby. Whether it's Pad Thai, Spicy Coconut Curry, or Sushi, we will make you feel right at home with an array of Thai, Chinese, or Japanese specialties. Grab a seat at the sushi bar and watch as our talented chefs use only the freshest seafood to craft your selections. A full-service bar and friendly staff complement the comfortable, contemporary atmosphere. Seasonal outdoor dining and take out available. Voted one of the top restaurants in the Valley in 2015 for their fresh Mediterranean cuisine. Celebrate the soul of the Mediterranean with kabobs, tapas, falafal, grilled specialties, fresh salads, and baklava. Try our Sunday brunch, as well as our Tuesday through Saturday luncheons which feature our extensive salad bar. Share this delicious homemade food at your next family gathering, celebration or business meeting by having River's Edge Bistro cater your next event!